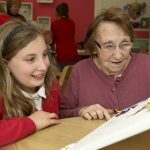 Wrexham school pupils make memories with care home residents | News by Wales Express News, People Before Profit! 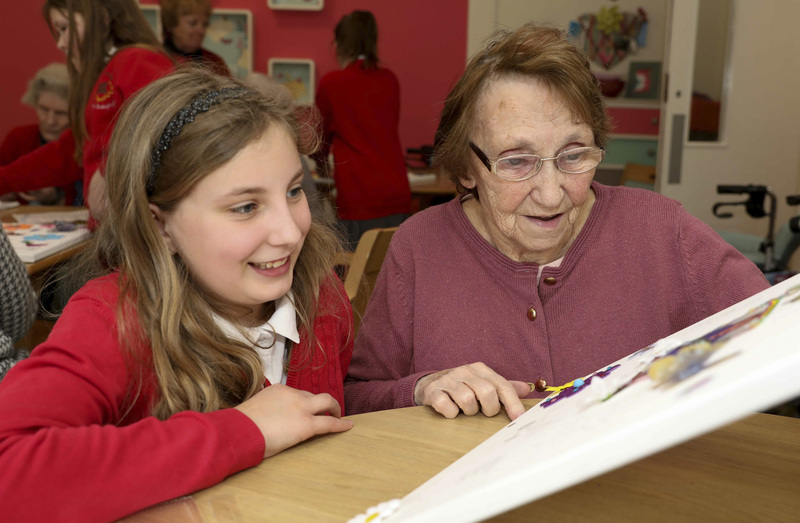 Artistic schoolchildren worked with care home residents to make sure their memories aren’t forgotten. Pupils from Ysgol Bodhyfryd have spent time chatting with residents of Pendine Park’s Hillbury House Care Home in Wrexham to find about what they liked and enjoyed doing when they were younger. The youngsters then researched their findings and found appropriate pictures and art work that they took back to the care home and worked with residents to create individual memory boards. The intergenerational project is the brainchild of the school’s former head of infants Heulwen Harris whose father was a Hillbury House resident. Heulwen said: “I have always tried to involve children from Ysgol Bodhyfryd with Hillbury House residents. I believe it helps the children get a real understanding of older people and I know how much residents enjoy having children visit. Pupil Grace Spragg, 11, worked with resident Nancy Povey on her memory board which included a ballerina, bank notes and butterflies. Grace said: “I talked to Nancy and learnt that she was a dance teacher so I wanted to include a picture of a ballerina. Nancy also told me she raised a lot of money for charity so I included pictures of a £10 and £5 notes. “She also told me her favourite colours were pink and blue so I made sure we had those colours too. I have really enjoyed talking to Nancy and learning about her life and the things she has done. Nancy Povey, 90, said: “It’s great and I’ve enjoyed it. Grace has done a great job. I’m glad we have a dancer on the board. I started dancing when I was six and was still teaching dance right up into my 80s and before I came to Hillbury House. Pupil Emily Vening, 11, worked with resident Shirley Carrington to make her memory board. Emily said: “I talked to Shirley and found out what she likes. She enjoys Coronation Street, roast dinners, dogs, butterflies and the colour purple. So I’ve made sure we have included pictures of all those things. Shirley Carrington, 83, was delighted with the outcome. Hillbury manager Cindy Clutton said; “We are really privileged to have such a strong relationship with Ysgol Bodhyfryd. Heulwen’s dad was a resident here for a long time and Heulwen has always worked hard to involve pupils with the home. “It’s a fantastic way of getting children and residents working and talking together. It means a lot to residents and I know they really look forward to the children’s visits. The atmosphere really lifts when the children come through the door. “Enriching lives across the generations is integral to our ethos at Pendine Park as well as raising awareness about disabilities, including dementia, and in that regard this particular project ticks all the boxes.